A weeping form with single pink flowers in March-April before the leaves, borne in two to five flowered clusters. Subhirtella cherries are among the cold, heat, and stress tolerant of the species. 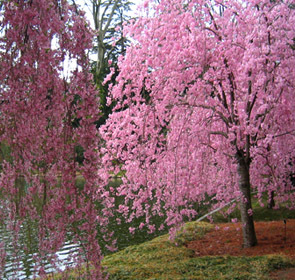 Once established they are long lived and offer the garden a subliminal quality unavailable from other ornamental trees. These trees are well branched and should bloom next spring. We should note that it can take 2 years to bloom.